One who was born in around 1815-1820 and came to the US by around 1840, last name (Craney) seems to be uncommon but mostly associated with various places in Ulster and he was likely Protestant, but he's my big mystery ancestor. The only origin I have for him is "Ireland." Another was born in 1810 and came over around 1830, later fought as an older man in the CW (for the Union), along with a few of his sons. His surname was Allen (which could be English or Scottish), and his mother's maiden name was Morewood, which seems English. From Antrim, Presbyterian. As I said probably limited mixing. Personally i’ve Noticed a wide range of figures for Ulster Scots people. The Ireland percentage ultimately seems to be based on how much English ancestry they have. That’s an extremely amateur observation, but it is something i’ve noticed. I live in an area that is bordered with heavily Scottish plantation to heavily English, to the south. It would be interesting to see what people in North Antrim got in the new algorithm as that would be an area devoid of much English plantation, unlike my area. I must admit I only have two obvious English names in my tree though. All are Irish and Scottish lol. Last edited by Nqp15hhu; 12-20-2018 at 05:33 PM. I hadn't noticed that (or hadn't been there since they added it). Very cool! 1. Västra Götaland County -- this is where my gg-grandparents came from! 2. Greater Manchester -- also probably pretty mixed, but I wonder if it drew more from the Welsh border, the Midlands, etc., given location, as I have ancestors from Shropshire and northern and more central Wales, any many cousins who seem to have moved to more urban areas in the general region in the mid and late 1800s. 8. Glasgow City -- dunno, but I have Ulster, maybe some connection? This misses my Welsh (which LivingDNA pegs), but I'll guess that Wales just does not have enough testers, and I do have more English than Welsh, although the Welsh is (mostly) more recent and I know where it's from exactly. I'll note that a lot of my English ancestry is far enough back that I don't know, although I would have expected to see more East Anglia and southern based on paper and LivingDNA (although LivingDNA misses the German so that could be related). For what it's worth, the only places I know of ancestry from in Ireland are all absent: Antrim, Derry/Londonderry, and Armagh. But based on last names they easily could be showing as English or Scottish. How did you find or access this on 23andme? Last edited by Ruderico; 12-21-2018 at 09:59 AM. It's a new beta feature (so not everyone has it). jshook mentioned it so I checked and had it. 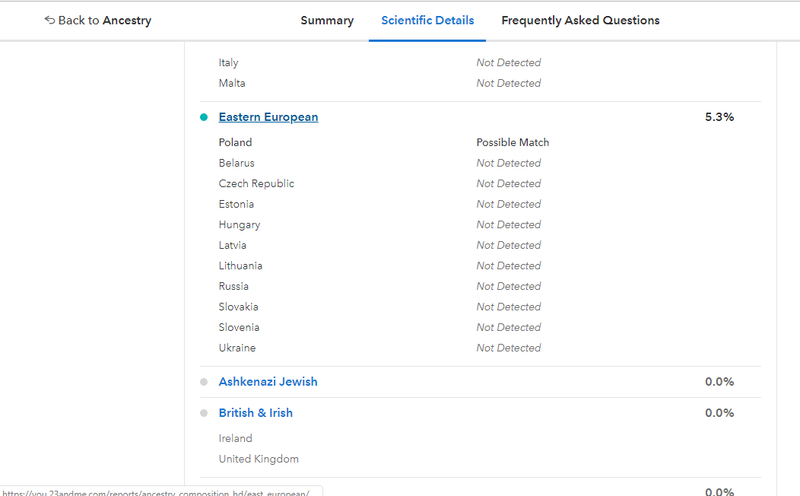 When I click on Ancestry Reports, it now shows me an overview page with "Your Ancestry in Detail" options for the three ancestry categories mentioned (British/Irish, French/German, and Scandinavian). That’s right although I don’t know what the Ireland and Scotland category is composed of? The communities line up with my known ancestry, as well as the LivingDNA result output for UK regions. Unfortunately deeper ancestry is hard to determine since all my ancestry within the last 200 years is all from the same country, and even similar regions in that country on both sides of the family. Not sure if my father's "Sweden" signal is accurate, but I can confirm a 3rd cousin with my surname has Norway(12%), Sweden(2%), and Germanic Europe(5%) in his results. That "Wood" relative lacks the high Ireland and Scotland because he doesn't share the Cornish ancestry we have.